Both North Shore residents, Tallboy and Denahy know Lynn quite well. 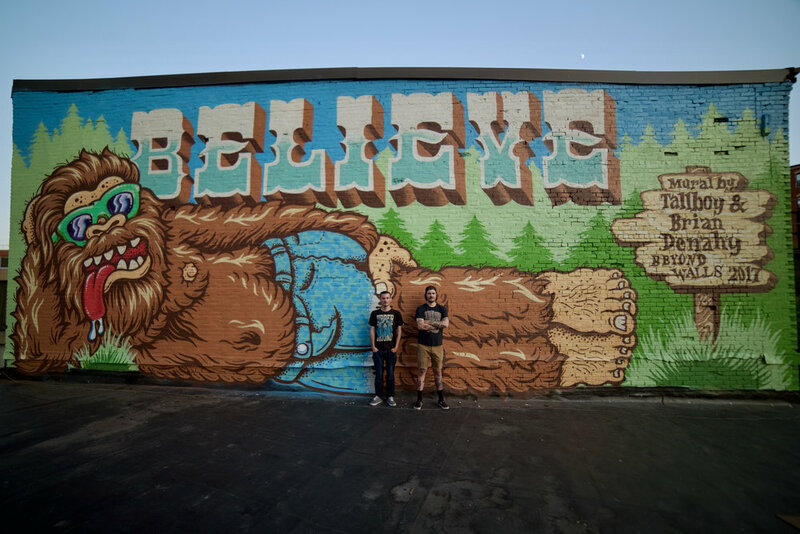 Tallboy, who grew up in Lynn, has been an illustrator for almost 10 years, making artwork for brands such as Creature Skateboards, Santa Cruz Skateboards, Emerica Shoes, and Volcom Clothing. Nowadays, he co-owns Night Watch Studios with his wife, where they sell products online and curate 'zines featuring a lot of other like-minded artists. Brian’s work varies in scale from large typographic murals to smaller commercial signs while always remaining focused on using typography to tell a story. In a time where the visual landscape is dominated by mundane, cookie-cutter, perfectly precise computer generated fonts and images, Brian’s work brings thoughtful, creative, handcrafted letterforms back into the public sphere.Brian’s work brings thoughtful, creative, handcrafted letterforms back into the public sphere.